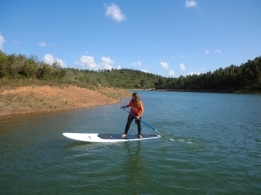 The ASI SUP Wise for Instructors Foundation Skills course covers the ASI methodology, terminology, guidelines and technique for paddling with safety and competence at enclosed flat water locations. It also provides an overview of the SUP Wise certificate program. These are essential knowledge and skills required for ASI SUP instructors. Identify ASI methodology, terminology, guidelines and technique for paddling with safety and competence at enclosed flat water locations. Flat water, including inland waterways and bodies of water. eg. creeks, rivers, lakes, lagoons, estuaries, canals less than 1 km wide (0.6 miles). Participate in on water paddling, theory, knowledge, skills and techniques. Receive 2 hours sign off for paddling experience in the workshop. Complete 8 hours (e.g 4 x 2 hr sessions) on the water paddling experience with an ASI accredited or other approved SUP school / instructor and have them sign Certificate page in SUP Wise logbook.